“It’s another clever tale told here by Mr. Estrin. Nominally a Jewish novel (whatever the hell that is), it is a novel about the nonsensical manipulations we take in the name of religion. It is also a story about how those manipulations can and are used against the religious—rarely for their own good. Like the tales of Jonathan Swift, Estrin’s satire of modern day America is more than just a joke. It’s a warning we might do well to heed. Who would benefit if they really did bring The Rapture on? Marc Estrin follows another of his strange protagonists through a world troubled by what it knows and by how it applies that knowledge. From the first page, we are plunged into a global riot of paranoia, joy, and fear. But something is sadly familiar here, perhaps because we have been taught to anticipate a world in which people suddenly fly off the planet. It might be The Rapture. Or it might be some violation of the force of gravity. Whatever it is, it’s spreading madness, religious hysteria, and some truly formidable government powers. The voice of these Lamentations is a sixty-something, club-footed scientist named Julius Marantz, an obsessive researcher who suffers both from forbidden knowledge and an insistent conscience. As his spirit and his heart begin to fail, Julius realizes what is lost to him: a childhood of possibility, the consolation of belief, and the undying optimism of a father who taught him the principles of physics on the roller-coaster and the parachute jump. 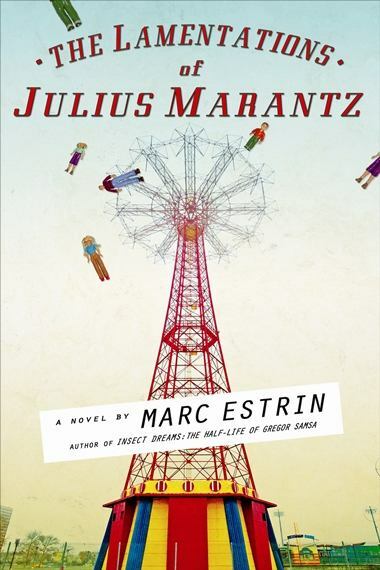 Partly a portrait of cynical politics and religious fervor, part scientific speculation and even a meditation on the glories of Coney Island, The Lamentations of Julius Marantz traces the rise and fall of science in a truly personal story that finally fairly ascends. By the fourth Cyclone ride, physiology had been suspended, or at least relegated to proper minority, and Julius and Philip were able to experiment with outbreath vs. inbreath, screaming vs. silence, standing (briefly) vs. sitting, eyes shut vs. open, with looking backward vs. forward. They had even discussed, en route, the shouted possibility of Julius’s getting married on a roller coaster, though the whole idea of marriage was still, to him, outré and disgusting. “No,” was his answer. On land, Phillip was loaded for pedagogical bear. Still staggering off the Cyclone, he pulled from his pocket three marbles and little ball of string. Using his ear-flapped hat as a container, he created an impromptu centrifuge, the first of many swinging things on strings, sometimes including in their construction small spring-scales which Julius found decapitative threats and impossible to read. But he got the idea: the balance of centrifugal and centripetal forces. Newton’s third law. Newton played a large part in child Julius’s life as a large-headed, weak-bodied, doppleganging sibling, as well as incarnated as Julius’s pet lizard, which he had bought on the boardwalk from a red-headed clown with a set of strong, white teeth, hawking, “Charming gentleman for sale”, the which turned out to be a grotesquely appealing eyelashed, or Satanic, gecko, Uroplatus phantasticus. The name “Newton” seemed obvious to Julius, since the quadruped could walk on ceilings, though his namesake, for all his power, was never known to do so. But it was not the Cyclone that most called forth the great Sir Isaac (Isaac! ), it was, of course, the Parachute Jump, what Philip called the I-fall Tower, that cross between art deco and military-industrial, recently migrant to Brooklyn from Queens. With lap bar down, and his father’s arm to keep him from slipping through, Julius would begin the 250-foot ascent, more than three times the Cyclone’s height, his club foot swinging like a tiny pendulum in a huge grandfather clock. Father and son would rotate their rides around the compass points, noting the landward landmarks, and the seaward lack of them, ominous, mysterious. The sounds faded away until all they could hear was the windharp song of the cables. It was coming, he knew — the fall, whoosh, to Steeplechase Park, the falling apple of his father’s eye. Though they hit the shocks in about the time it took to say the verse, there was time during the lift to talk of many things — of potential and kinetic energy to be sure, but also of rising and falling , and upness and down, of the cloud about their ears and the cloud of unknowing, and about the possibility of a wedding in freefall. The answer again was “No.” How could anyone be owned by another person when he was owned by gravity? “What made you want to be a physicist?” Julius was often asked. The answer was obvious.